Iran, July 6, 2018 - While we approach the yearly ceremony at Babak Fort, a monument of ancient Persian history, the agents of the Iranian regime’s Ministry of Intelligence and Security (MOIS) have proceeded with arresting and imprisoning dozens of people from the cities of Urumiyeh, Ahar, and Moqan. According to some sources, the number of arrested is as high as 50. The fort is located in the mountains near the city of Kalibar in Eastern Azerbaijan, northwest of Iran. It is the stronghold of Babak Khurramdin, a historic Persian figure who fought against the foreign invasion of the country. Every year, Iranians gather at the fort to commemorate and celebrate the legacy and memory of Khurramdin. This is a tradition that has gained popularity in the past decades, and many tourists attend the ceremony every year. The Iranian regime, which is afraid of national figures and traditions and ceremonies that bring together crowds of Iranians over a common cause, has been disrupting the process in the past years. This is a trend that has been seen elsewhere in Iran, such as the tomb of the ancient Persian King Cyrus, where every year thousands of Iranians gather to celebrate his memory on his birthday. 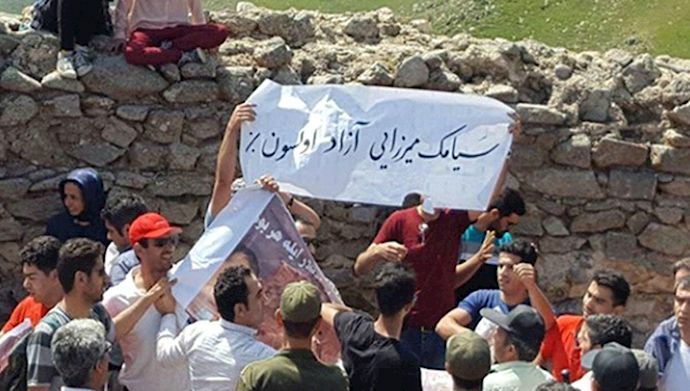 According to local reports, this year, the regime started arresting people a week before the annual ceremony at Babak Fort, which happens during the first week of July. Security forces have beaten the arrested after they protested to their conditions in prison. At least one prisoner, Abbas Lessani, is reported to have disappeared and there’s no news of where the regime’s security forces have taken him. Other people have been summoned to court and threatened with arrest and interrogation if they do anything to incite protests during the days of the ceremony.